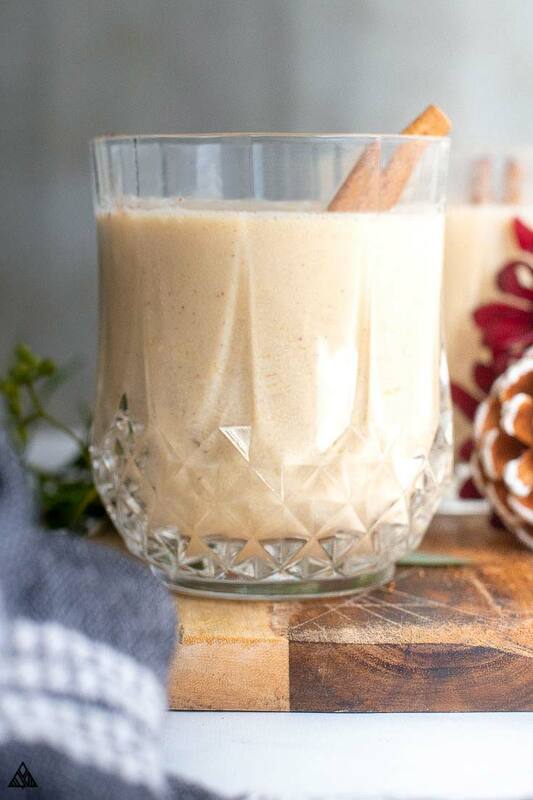 No holiday season would be complete without a glass of keto eggnog — and luckily for those of us on a low carb meal plan, this glass of joy is every bit as tasty as the traditional kind! It’s perfect to make before Christmas caroling, holiday movie nights, and (awkward) family get togethers — not to mention, none of your friends and family will know it’s a low carb recipe! So cheers to the holiday my low carb friends — now let’s make some keto eggnog! Traditional eggnog recipes call for a few carb laden ingredients we’ll skip in our keto eggnog: sugar and cows milk. Instead of sugar, this keto eggnog recipe calls for erythritol. It’s my favorite of the keto sweeteners, as it tastes, looks and feels just like regular sugar! Some of you may notice a slight cooling effect in the back of your throat (similar to peppermint) when consuming erythritol — but other than that it’s the tastiest alternative to sugar I’ve found. It can be hard to find in stores, some health food stores sell it (such as Whole Foods) — so I often buy it in bulk on Amazon (Swerve is my favorite brand). We’ll also swap cow’s milk for a low carb milk alternative. I know, I know — cows milk doesn’t taste or seem like a typical carb, but it’s full of sugar (i.e. lactose) that those of us on a low carb eating plan will want to skip. Low carb milk include almond milk, coconut milk, cashew milk, heavy cream, the list goes on! Be sure to read the labels on products before purchasing, as some may included added sugars. In this keto eggnog I opted for a combo of almond milk and heavy cream — the cream cranks up the silkyness of this tasty treat, while the almond milk lightens it up. Tips for low carb eggnog Perfection! Making low carb eggnog is rather easy, as long as you pay attention to the temperature of your eggs. Heat them low and slow — rushing this process may yield a cocktail with a few floating scrambled eggs, no thanks! For some of us (me included), separating the egg yolks and whites can be tricky. I find the easiest way to do this is using the three bowl method, in which you crack an egg into one bowl and use the shell to grab the yolk. Dump the yolk into a second bowl, then pour the egg whites into the third — leaving you with one egg yolk bowl, one egg white bowl and one “cracking” bowl. You know I hate wasting food… traditionally keto eggnog is made with raw egg whites as well but I wanted to skip the extra step of adding them to this recipe. Instead I place them in an airtight container and into the fridge for tomorrow morning’s eggs! The trickiest part of making keto eggnog is tempering the eggs. This step takes a steady hand and some patience! The first time I made keto eggnog, I was trying to speed up the process and wound up with a low carb alcoholic drinks that had the texture of egg drop soup — definitely not as tasty. To prevent this, you’ll want to temper your eggs. To do this, mix your eggs using an electric mixer while slowly adding the hot mixture — one spoonful at a time. Since this sugar free eggnog recipe makes quite a large batch, I love to whip up a batch of keto eggnog non alcoholic (just skip the low carb alcohol in the last step) and adding it to all sorts of recipes! That way, when you’re craving a nightcap, all you have to do is add a shot of bourbon — but if you’d like to add it to your morning coffee, it’s ready to go! Making a keto eggnog latte with this as a base. I usually add 1 shot of espresso per 4 ounces of milk. Make low carb french toast — that’s right! Dip your favorite low carb bread recipe into this combo, then grill it on the stove. 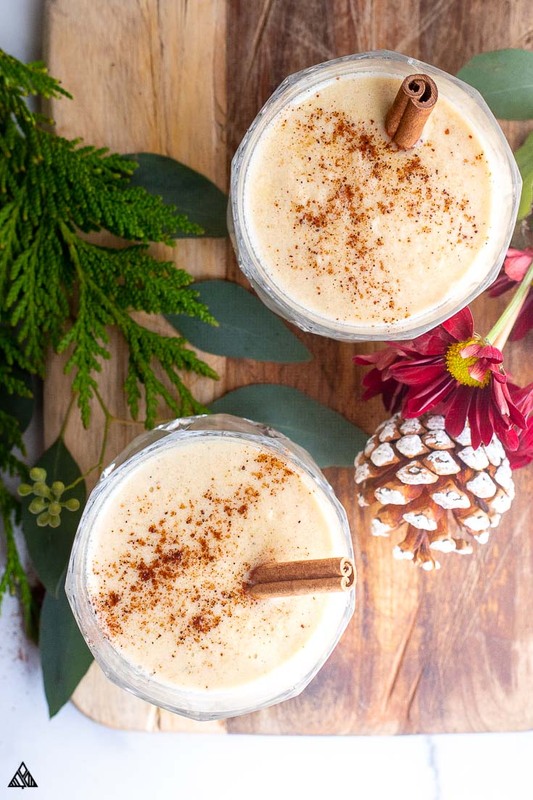 Add to your low carb smoothies — this may sound weird, but the festive spices in this drink make for a delicious keto eggnog shake. Blend it up with some ice and berries! Make keto hot chocolate with this in lieu of milk/cream. Make keto eggnog almond milk ice cubes — Ohhh yes my friends, eggnog ice cubes are delicious to pour cold coffee over! This is a great way to save leftovers when you’re making keto eggnog for one. There are a billion more labor intensive low carb recipes you can add this to — from keto eggnog pudding to keto eggnog cheesecake, get creative and let me know what you try in the comments below! Pst — Traditionally, alcohol is added to eggnog to extend its shelf life, as very few types of bacteria are able to grow in the presence of alcohol. 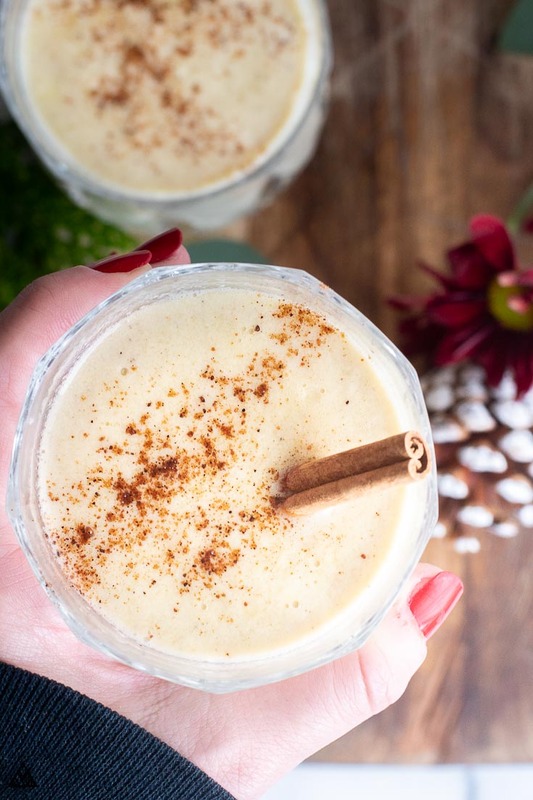 My family and I gobble up this keto eggnog so quickly, it isn’t a huge problem in our house! Cheers my fellow low carb foodies! Wishing you and your family the happiest of holidays — I hope this keto eggnog recipe bring a little cheer to your home. 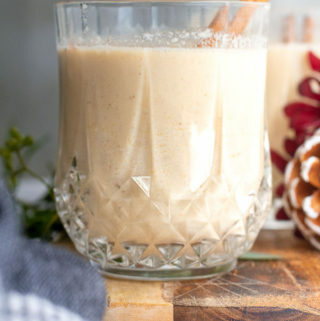 No holiday season would be complete without a jolly glass of low carb keto eggnog! Make it alcoholic or non-alcoholic, with this super easy recipe! Combine milk, heavy cream, cloves, cinnamon and nutmeg into a small saucepan and heat slowly to bring mixture to a boil. Remove from heat as you prepare next step. 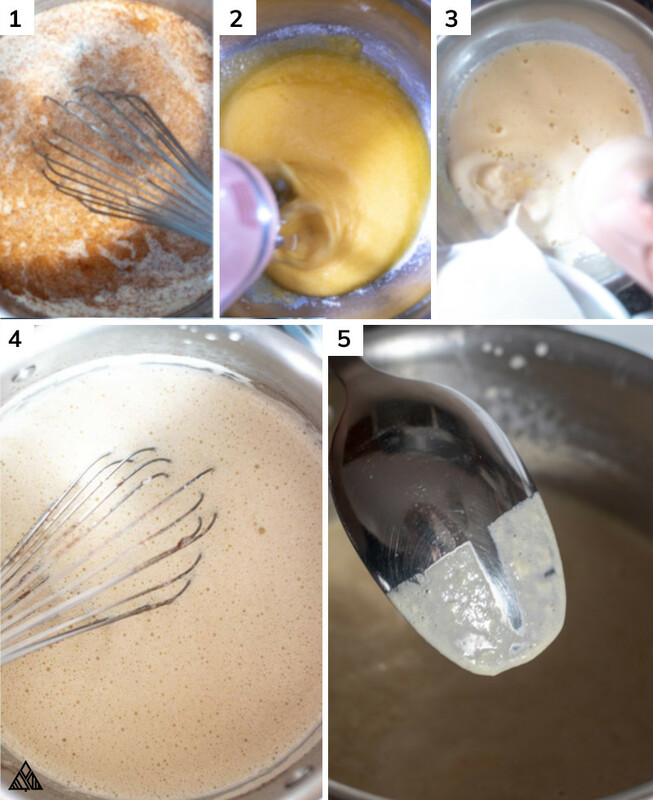 In a large bowl, combine the egg yolks and sugar using an electric mixer until fluffy and the sweetener has dissolved. Slowly add very little at a time of the milk mixture into the bowl of egg yolks while the electric mixer is running. Once combined, pour contents of bowl into saucepan and cook for about 3 minutes, stirring constantly. Don't allow this to boil. Strain to remove cloves and place in the fridge to cool for at least an hour. Pour in vanilla and rum. Top with cinnamon and nutmeg and enjoy! The exact serving size for this keto eggnog will vary based on the size of your egg yolks and the amount you cook the liquid down. I was able to make 5 3/4 cups of eggnog with this recipe, which would mean a serving size is equal to about 1/2 cup. 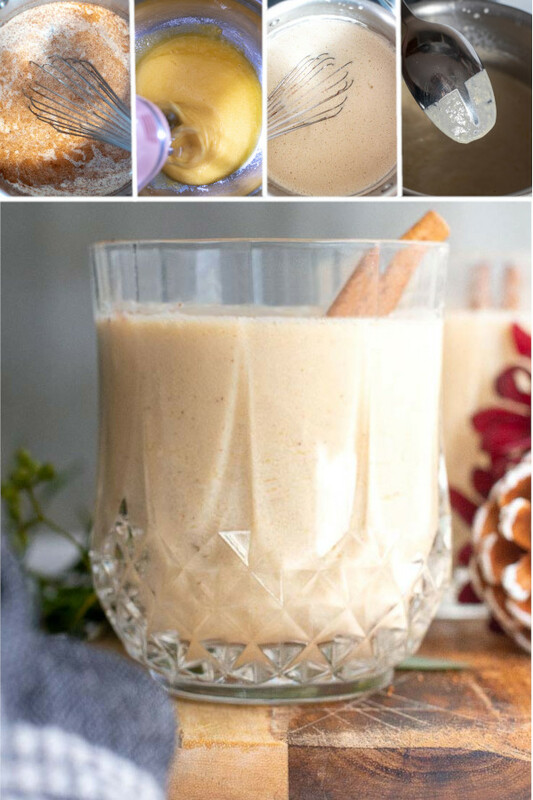 *Recipe Adapted from traditional Eggnog recipe on Allrecipes! Your recipe calls for 3/4 c sugar. Didn’t you mean to put a sugar alternative like monk fruit, stevia or erythritol instead. I don’t think adding that much sugar to a recipe could possibly make it low carb. Hi Lisa! Great question! I use erythritol on this because I love it more than any other sugar alternative 🙂 As always, you can use any sugar alternative of your choice. Hope you enjoy! How much is one serving? I see this makes 21 servings but does not list how much is a serving. THANKS! Hi SJ! I adjusted the serving size a tad, this recipes makes about 11, 1/2 cup glasses of keto eggnog (see notes in recipe above). Hope you enjoy!